Can you tell I'm still really ready for Spring? 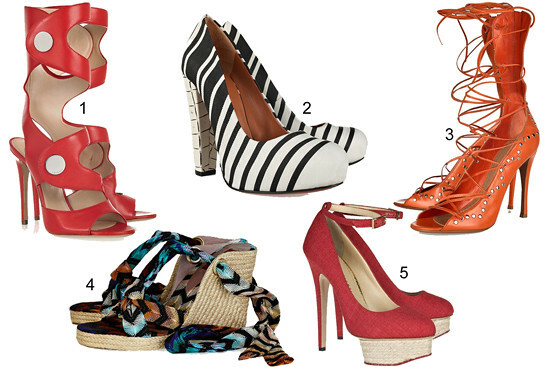 This week's Shoetastic Sunday is filled with colorful shoes and sandals again! I stumbled upon these shoes on the Net-A-Porter.com site and fell in love. The colors are gorgeous and I'm in love with this tie me up/ankle wrap thing that is trending. Net-a-porter has a fabulous selection of top notch designers, some way out of my price range, but still gorgeous. I'm adding these to my Dream Luxe list! I'm thinking that those Missoni espadrille would be perfect for my upcoming vacation. Don't you agree? Those Missoni espadrilles are divine! I'm planning a trip to Spain this spring, and I'm all over those. Oh pretty shoes, can I have pair 4 please! I love espadrilles! I'm a shoe-obsessed person. Show me stuff like these and I go crazy!